This past week at the UN General Assembly in New York has seen some significant developments towards changing the reality for women prisoners. Yesterday the UN Special Rapporteur on Violence against Women, its causes and consequences, Rashida Manjoo, presented a new report to the UN General Assembly, Pathways to, conditions and consequences of incarceration of women. This comprehensive report illustrates the strong link between violence against women and women’s imprisonment – prior, during and after prison. Ms Manjoo gives examples from all corners of the globe showing how women’s imprisonment so often stems from human rights violations, such as history of violence, anti-drug policies and the use of pre-trial detention. The report looks at the often equally discriminatory conditions women experience when in prison, the violations of privacy, overcrowded facilities, inadequate healthcare and the lack of appropriate or effective rehabilitation programmes. She also notes that the UN Bangkok Rules established for the first time standards that provide specifically for women prisoners, offenders and women accused. The Rules give comprehensive guidance for the gender-sensitive treatment of women prisoners and offenders, covering contact with family members, alternatives to imprisonment and addressing prior victimisation. Last week, also at the UN General Assembly, we moved a step closer towards the all-important implementation of these Rules. At an event hosted by Thailand, Penal Reform International and the Thailand Institute of Justice (TIJ) on the Wednesday, PRI and TIJ launched the Toolbox on the UN Bangkok Rules, which includes a Guidance Document and Index of Implementation and a free online course, Women in Detention: Putting the UN Bangkok Rules in Practice, among other resources. Watch the webcast and a report from South-South news on the event. See our trailer about our free online course. 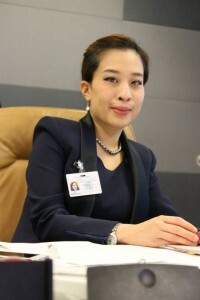 As another panellist at the event, Simone Monasebian of the UNODC, quoted: ‘Publicity is the soul of justice.’ The [Bangkok Rules] are only as good as the dissemination of them. Please visit our page on women in the criminal justice system to find out more about the UN Bangkok Rules Toolbox, which also includes a short and accessible introductory guide to the Rules. Please forward to others you think might be interested. PRI will be continuing to work on the promotion of the Rules, seeking to make the Toolbox accessible in more languages. Keep up-to-date with the Bangkok Rules e-bulletin, a quarterly newsflash of progress, news and blogs on women in the criminal justice system. Sign-up by emailing info@penalreform.org. Photo: Panellists at event co-hosted by PRI, Thailand and TIJ at the UN General Assembly on ‘The human rights of women in prison: A toolbox to implement the UN Bangkok Rules’. 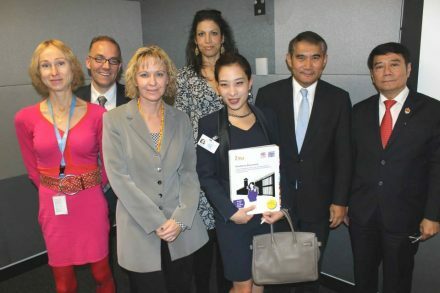 From left Mari Amos, UN SPT; Frank Elbers, HREA; Andrea Huber, PRI; Simone Monasebian, UNODC; HRH Princess Bajrakitiyabha Mahidol of Thailand; Ambassador Norachit Sinhaseni, Permanent Representative of Thailand to the UN, New York; Ambassador Adisak Panupong, Thailand Institute for Justice.